The trade agreement between the U.S. and China, which is expected to be finalized by March 27, should drive the price of basic materials higher. The agreement will be based on reciprocal concessions both countries will make in terms of lower tariffs on several imported goods, according to Bloomberg. Warning! GuruFocus has detected 1 Warning Sign with GGB. Click here to check it out. In light of this, investors should added to their holdings of publicly traded companies operating in the basic materials sector because their revenues will likely increase on higher pricing for basic materials, pushing share prices upward. Therefore, I screened the U.S. stock market for mid- to large-cap iron producers. To increase the odds of unearthing value, I looked for stocks with a price-book ratio of 1 or less and with an earnings before interest, taxes, depreciation and amortization margin that is higher than the industry median. The result of my screening is Gerdau S.A. (GGB). Based in Sao Paulo, Brazil, it is an international steel producer. The company provides its customers in the construction and manufacturing industries with semi-finished metal products such as billets, blooms, slabs and common long rolled metal products such as wire, fences and meshes, clamps and nails. Gerdau also produces special steel products in the U.S. and Brazil for light and heavy vehicles, machinery and equipment, as well as energy, mining and rail. The company's revenue includes direct sales from the facilities and independent distributors. Gerdau's results for fourth-quarter and full-year 2018 show that revenue depends heavily on the price of basic materials, meaning the company is strongly positioned to benefit from the trade agreement reached by the U.S. and China. Despite an 18% year-over-year decline in steel production to 3.2 million metric tons and a 16% decline in steel shipments to 3.2 million metric tons in the fourth quarter, sales increased 11% to nearly $3 billion as a result of higher prices. From total revenues, adjusted EBITDA of roughly $376 million was dropped, marking a 21.4% improvement on a year-over-year basis. In full-year 2018, crude steel production of 15.3 million tons was 4.8% lower than in 2017 and steel shipments decreased 2.5% to 14.5 million tons. Nonetheless, sales grew 25% year over year to $12.4 billion. Steel production and shipments were influenced by the divestment of operations at Gerdau in India at the end of October and the sale of four U.S. rebar factories in November to Commercial Metals Co. (CMC) . Further, the trailing 12-month adjusted EBITDA margin is 12% compared to an industry median of 9%, indicating the Brazilian steel producer is better positioned to benefit from the catalyst than its competitors. Wall Street issued a buy recommendation rating for shares of Gerdau with an average target price of $5.19. The estimate is a 30.4% premium to the closing share price on Friday. The stock is not expensive. Shares closed at $3.97 on Friday for a market capitalization of $6.43 billion. After a 24% drop for the 52 weeks through March 1, the price is slightly below the 200, 100 and 50-day simple moving average lines. The price is 17.8% above the 52-week low of $3.37 and 33% below the 52-week high of $5.32. The stock has a price-book ratio of 1 versus an industry median of 0.99 and an EV-to-EBITDA ratio of 6.49 compared to an industry median of 8.71. The 14-day relative strength index is 40.99, suggesting the stock is closer to oversold than overbought levels. Concerning financial strength, GuruFocus gave Gerdau a moderate rating of 5 out of 10. 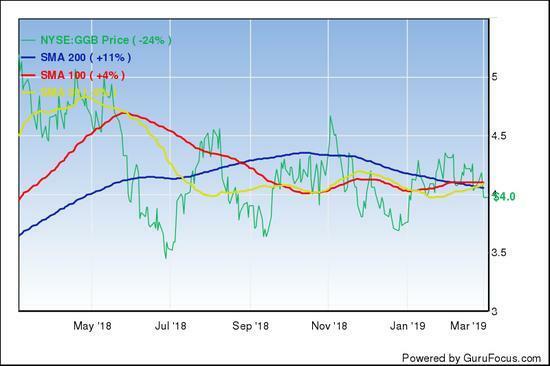 Gerdau is paying a quarterly dividend of 3.395 cents per common share, leading to a forward dividend yield of 3.42% versus an industry median of 2.89%. The company has paid dividends since 1999.